Head Full of Teeth. Awesome Eraser. My eight-year-old son, Mini-Bash, apparently has a head full of teeth. His adult teeth are coming in funny, which means to make room for them, he'll need to have some pulled—and probably braces. I had to get braces. My teeth as a little kid were all kinds of crooked. I really, really hated going to the dentist—a fear that I still have to this day. Mini-Bash's dentist seems pretty nice. 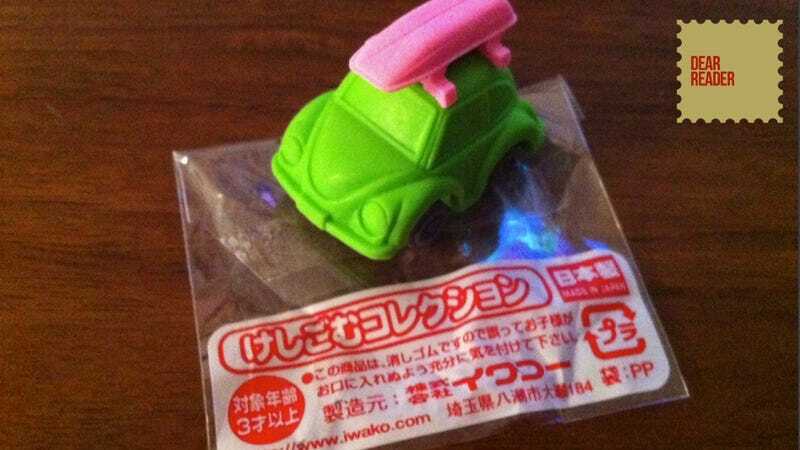 All the little kids get awesome Made-in-Japan Iwako erasers, like this cool eraser car (above). It even has little wheels, and it can roll. The only thing the adults get is a bill. When I was a kid, my dentist used to give me stickers. No rolling eraser cars for me. Postcard is a daily peek behind the Kotaku East curtain, whether that be game-related or not.